Please review full Inspiration Award Guidelines and submit a Nomination Form today! 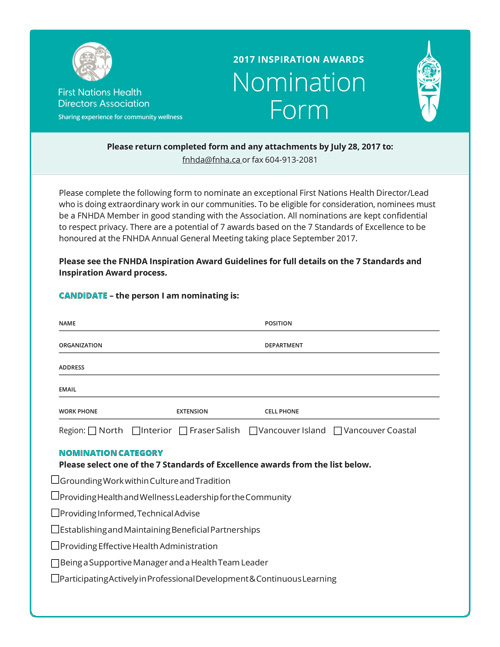 Now is your chance to nominate an exceptional First Nations Health Director/Lead who is doing extraordinary work in our communities. To be eligible for consideration, nominees must be a FNHDA Member in good standing with the Association. All nominations are kept confidential to respect privacy. There are a potential of 7 awards based on the 7 Standards of Excellence to be honoured at the FNHDA Annual General Meeting on September 26-28, 2017 taking place on Squamish/Lil’wat Territory . Please see the FNHDA Inspiration Award Guidelines for full details on the 7 Standards and Inspiration Award process. The role of a Health Director can be demanding; it is important for us to collectively celebrate each other and the work that we all do as leaders for community wellness. Through honoring our colleagues the FNHDA strives to inspire others to continue on their wellness journeys, share best practices of our achievements with one another and support each other in our journeys. In 2012, the FNHDA established the Inspiration Awards as an opportunity to recognize and honour our association members for their dedication, passion and contributions to our work in communities. During our FNHDA AGM, we share an Inspiration Awards Ceremony, to honor inspirational Health Directors recognized for their hard work, tireless dedication and passion for our field.